To learn how to use the built-in RadChart Drill Down feature please read the Drill Down section. The purpose of this tutorial is to show you the drill down capabilities of the chart with tooltips enabled. The idea behind the drill down behavior is to move the chart content from summary information to detailed data by focusing on something. 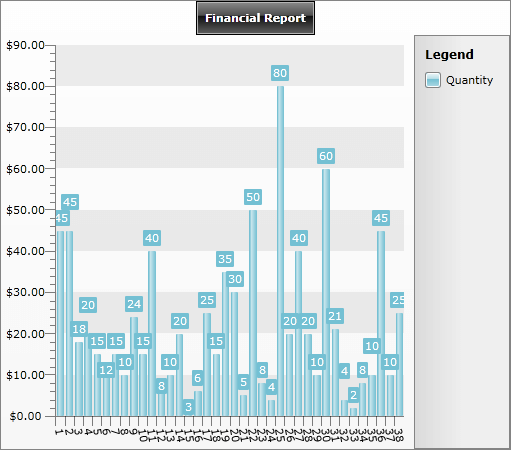 Also in the following examples the charts will be populated with a various data from an ADO.NET Data Service. You can read more information about populating with data here. Here is the initial RadChart declaration. When the application (the user control) is loaded, the RadChart is populated with the first eight products from the Products table in the Northwind database. On the Y Axis is displayed the products UnitPrice. On the X Axis is displayed the ProductName property. This is done through the ItemsMapping property. The NorthwindDataSource class is used for ItemsSource of the RadChart. 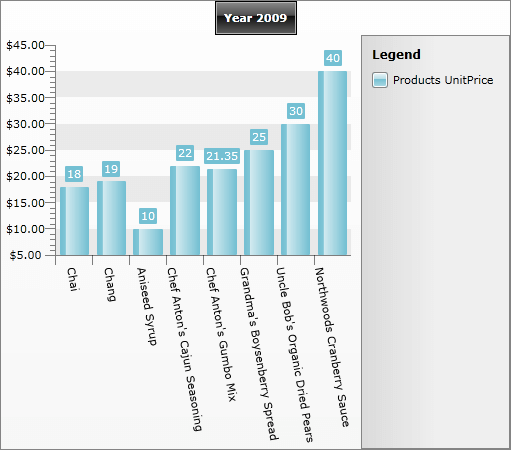 Products - displayed during the initial load of the RadChart. OrderDetails- displayed as a tooltip for a specific product in the chart. 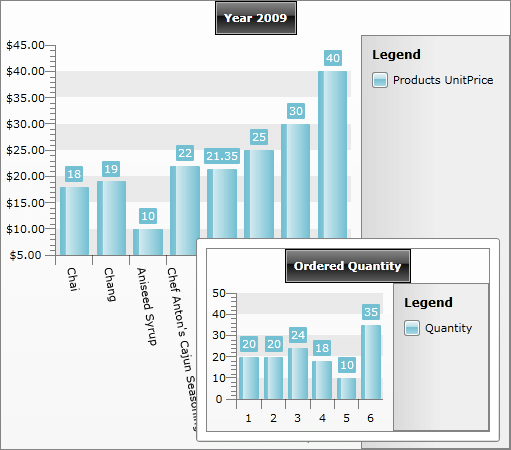 More detailed information about the order details is displayed when the user clicks on a chart item. Enable ToolTip. In order to do that use the ShowItemToolTips property. Attach to the ItemToolTipOpening event. Second, the BeginLoadingOrderDetails() method is invoked. Finally, a new instance of a user control is created and is set as a content of the tooltip. The final step is to add the drill down behavior. To do that, attach to the ItemClick event.